That is exactly what a chyrpy from Turkmenistan is: a beautiful garment (a woman’s mantle) that embodies the fascinating culture of the tribal peoples of this ancient and mystic land. 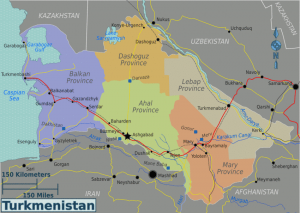 Predominantly desert, Turkmenistan is one of the five former Soviet republics in Central Asia and is bordered by Afghanistan, Iran, Uzbekistan, Kazakhstan and the Caspian Sea. In the south, Merv was once one of the great cities of Islam, rivalling Damascus, Cairo and Baghdad, and today its spectacular ruins are one of three World Heritage sites in present-day Turkmenistan – the others being the ancient capital Konye-Urgench and Nisa, one of the first capitals of the Parthians. The Turkmen people originated from the Mongolian Oghuz tribe and have a turbulent history. Feared throughout much of the region for their pillaging horseback raids on trade caravans of the historical Silk Road, they were known for taking slaves to be sold at markets in Khiva, Samarkand or Merv. The most powerful of the Turkmen tribes were the southern Tekke, who were finally defeated in 1881 by the Russians at the particularly gruesome Battle of Geok Tepe – “The harder you hit them, the longer they remain quiet” said General Skobolev, who commanded the Russian troops, in way of justification for the carnage. 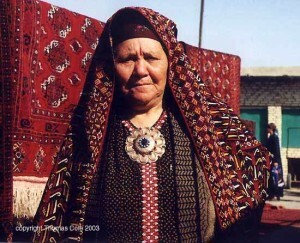 The Turkmen have a well-established reputation for weaving. 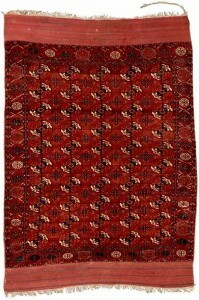 Tribes from the west weave carpets, tent bags and saddle bags characterised by rich red and brown colours, and by the frequent use of the gul motif. In the east, in East Turkestan (now formally Xinjiang, China), carpets were woven in several oasis towns, such as Khotan, Yarkand, and Kashgar. These were typically sold to western traders in the major Silk Road trading post of Samarkand, Uzbekistan. If you wish to know more about the Turkmen tribes and in particular their carpets, see the various articles made available by Thomas Cole. Within Turkmen society, particularly for women, jewellery and clothing have symbolic meanings through different stages of life. Girls wear an increasing amount of jewellery as they approach marriageable age, with the shapes and materials intended to ensure their ability to bear strong children. A married woman would wear extraordinary amounts, and this would decrease after childbirth and hence proven fertility. Elderly women wear very little. Made of silver, Turkmen jewellery is often large and heavy, incorporating semi-precious stones such as carnelian and turquoise, and sometimes gilded. Mountains, horns and animals are common shapes, and typical pieces include bilezik bracelets and armlets, and the dramatic large egme headdress. The Turkmen embroidery tradition is rooted in the belief that their intricate and beautiful needlework provides magical protection through birth, childhood and marriage. Different tribes have distinctively different ways of dressing. The chyrpy is a ceremonial garment most commonly associated with the Tekke tribe, and worn as a cloak over the head and shoulders. Made of silk, chirpys are covered with brilliant embroidery – mostly red with touches of yellow and white on a black background with tassels along the bottom. They have false sleeves, joined with an embroidered band and hanging at the back. Chyrpys are generally embroidered by women and use a “kesdi” silk lacing stitch to make the small motifs. The main embroidery pattern is of a stylised tulip – which occurs commonly throughout the region – arranged in geometric bunches. Other typical patterns include rhombuses adorning the collar and various border elements such as the diamond-shaped pishme, so-called because it resembles the traditional Turkmen fried snack served with green tea during celebrations. The fish motif represents another ubiquitous requirement in Turkmen life: that of good fortune and the provision of protection. The chyrpy also illustrates a woman’s social status. A dark blue or black chyrpy is worn by a younger woman, while married or middle-aged women will wear yellow and, in old age, white. White chyrpys would be relatively rare, worn only by a woman typically at least 60 years old and recognised within the community as having been a “good woman”. 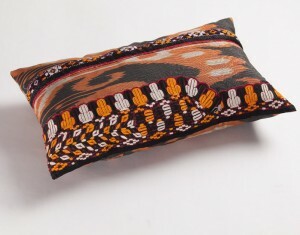 At Arastan we are pleased to have been able to obtain a very collectible vintage chyrpy, whilst the delightful embroidery has inspired us to create a very limited range of cushions highlighted with authentic Turkmen accents. 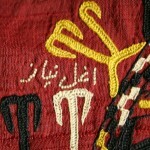 This entry was posted in Turkmenistan and tagged chyrpy, geok tepe, turkmen embroidery. Bookmark the permalink. Both comments and trackbacks are currently closed.